LA CELLE SAINT-CLOUD, France (AP) — President Emmanuel Macron opened meetings on Tuesday with the two main rival leaders of chaotic Libya, trying to play peacemaker for a country where the stakes are high for both Europe and Africa. The series of meetings at a chateau in La Celle Saint-Cloud, west of Paris, bring together Fayez Serraj, prime minister of the U.N.-backed unity government, and Gen. Khalifa Hifter, the Egyptian-backed commander of Libya’s self-styled national army. Macron was meeting separately with each ahead of an encounter between the two Libyans in the presence of U.N.’s newly appointed special envoy for Libya, Ghassan Salame. The encounters were expected to end with a joint declaration between the two Libyans which the French have billed as a first. Talks were centered on creating a propitious climate for elections next year — which the Libyan prime minister announced plans for in May — security and military issues, respect for human rights and economic development of the oil-rich nation where residents struggle despite the resources, French officials said. 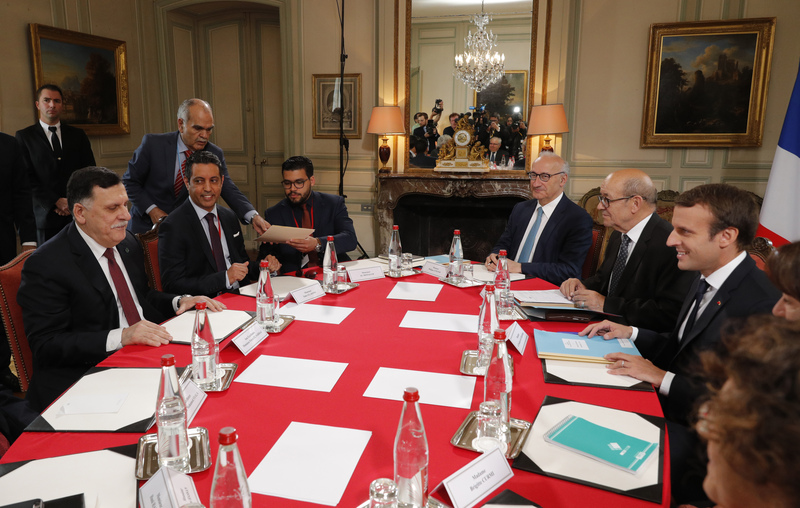 Macron, Salame and Serraj, along with French Foreign Minister Jean-Yves Le Drian, walked into the chateau to begin the first set of talks after shaking hands before Republican Guards in their ornate gear. Hifter arrived later, with no greeting from the president already at a table with his rival. French officials hope the meetings will facilitate a political entente. The joint declaration that will close off the meetings is to include, among other things, the need for a political — not military — solution to the crisis. It would also lay down the principle of a cease-fire — except for fighting Islamic militants, an official of the French presidential palace said. The declaration would be “simple but constructive,” according to the official, and be a first between the two protagonists despite past meetings. The official could not be named in keeping with presidential policy. The encounter is not expected to resolve the knotty problems of Libya, politically fractured and awash in militias and human traffickers preying on migrants who use the Libyan coast as a jumping off point to Europe, mainly Italy. But it would be a basis for the U.N. envoy to come up with proposals in the weeks and months ahead. Libya’s instability, triggered by the fall of leader Moammar Gadhafi in 2011, has an impact beyond its borders, for Europe and for France, and for African neighbors. Macron’s bid to work toward laying the groundwork for a state with a functioning government and institutions is a priority of his presidency. For French officials, the time is ripe for forward movement in the search for a resolution to the Libyan crisis. Sharing the international spotlight with Macron, elected less than three months ago, could boost the resolve of the Libyan rivals to seek a way out of their impasse. Serraj and Hifter met in early May in Abu Dhabi, and the United Arab Emirates said later there had been a “significant breakthrough.” Libya TV said the men agreed on holding presidential and parliamentary elections next year in the fractured country. Paris has made clear that the French initiative is not meant to brush aside numerous initiatives by others, including the European Union, the African Union and individual countries, like Morocco. France “wants to facilitate a political entente” and “mark its support for efforts to build a political compromise, under the auspices of the United Nations,” that includes all actors in the fractious country, a statement Monday by the president’s office said. The challenge, it added, is to “build a state capable of responding to the fundamental needs of Libyans” with one regular army “under the authority of civilian power,” considered necessary for the control of borders and stability within Libya. Ganley reported from Paris, Nadine Achoui-Lesage in La Celle Saint-Cloud contributed.